Group Concept Mapping is a widely used tool to articulate team research priorities and enhance research design, implementation, and evaluation. Ideal for seeking and valuing the voices of research team members in research design, it has proven value in articulating the priorities of the community in which research takes place. GCM connects the knowledge of stakeholders with mixed methods to yield community or team-specific frameworks on issues of relevance. This workshop is for researchers and evaluators with some familiarity with Group Concept Mapping or team strategy development for research. As an intermediate level training, this workshop links the philosophy and practice of Group Concept Mapping to community based participatory research and team science. It extends and builds upon basic GCM skills and practices, and introduces functional interactive analysis- a new application of network analytics to the GCM methodology. Through the use of small group exercises, practice and lectures, participants will learn skills for successfully engaging communities and teams, and systematically collecting and representing group wisdom. Participants will explore decision-making processes for finalizing the map output, and review approaches for producing results that increase the maps’ utilization. Individuals attending this workshop will be able to apply their learning to projects that require team model and research design construction, and incorporate stakeholder participation and group conceptualization. 4) Illustrate how to transform a small group into a productive learning-team. The workshop will conclude with a discussion of how and why TBL works, and evidence for improved learning using TBL in a variety of academic settings. The HUBzero® Platform for Scientific Collaboration is an open source software package used to create web sites for research, education, and scientific collaboration. Some call them “science gateways,” or “collaboratories.” We call them “hubs” for the community. So far, HUBzero has been used to create more than 50 such hubs across a wide range of scientific disciplines, including nanotechnology, bio-fuels, environmental modeling, volcanic activity, earthquake mitigation, microelectromechanical systems, cancer research, pharmaceutical engineering, and STEM education, to name a few. All together, these sites have served more than 1,000,000 visitors from 172 countries worldwide during the past year alone.In June 2011, the National Science and Technology Council’s Materials Genome Initiative for Global Competitiveness highlighted one of these hubs, nanoHUB.org, as an exemplar of “open innovation” that is critical for global competitiveness. In August 2011, HUBzero won the Campus Technology Innovators Award for IT Infrastructure and Systems. 5) question-and-answer forum with incentives for participation. This workshop will walk participants through various features with hands-on exploration of the functionality. It will present case studies of communities that have leveraged or perhaps even shunned various features. It will describe the data collected by various hubs and how it has been and could be leveraged for detailed studies of user interaction. For more details about HUBzero, visit http://hubzero.org. 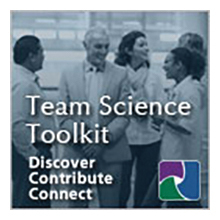 Team science initiatives are characterized by cross-disciplinary collaboration focused on complex problem-, project-, or product-oriented research. Over the last decade, academia has generated an upsurge in team science initiatives, while external funding agencies in the United States and around the globe have made more collaborative and team-based science funding opportunities available. Studies on research centers funded by the National Science Foundation (NSF) and National Institutes of Health (NIH) have demonstrated that team science initiatives entail significant coordination costs. As a result, team science takes more time, at least proximally, than individual research; however, studies have also demonstrated a distal payoff in terms of research acceleration. Consequently, it is imperative that team science leaders and practitioners understand the most effective practices for productive team science. Through a combination of lively lecture and interactive small group activities, this workshop will arm participants with a collection of evidence-based tools and resources for implementing effective practices in team science in the areas of team assembly and composition; trust and communication; expert discovery and collaboration; interdisciplinary grantsmanship; and networking. The workshop will: o Provide an overview of team science, from empirical research to practice; o Offer evidence-based insights and techniques on team science leadership; o Demonstrate tools and resources that promote collaboration, communication, trust, and conflict management in science teams; o Engage participants in a real-world case study discussion; o Describe specific strategies and tactics for grantsmanship to support team science; and, o Use the online TeamScience.net tool and Team Science Toolkit in practical, interactive experiences.